E D G E | who's that knocking...? 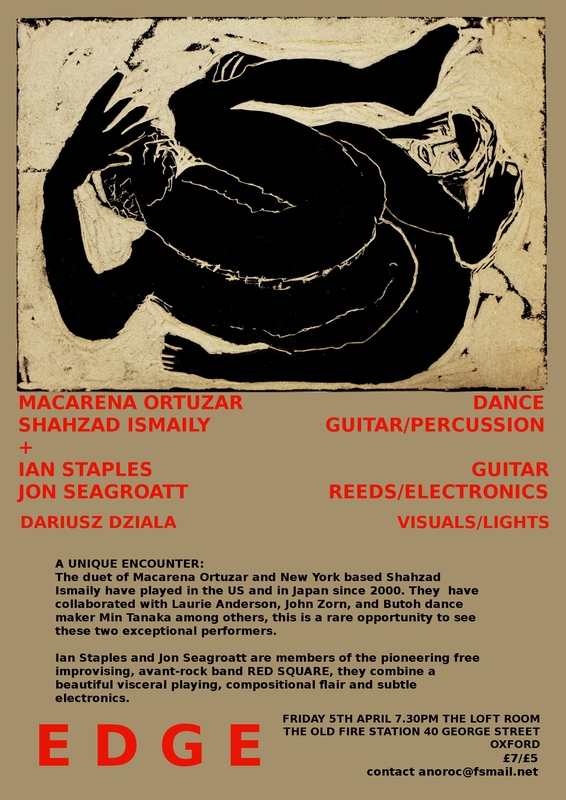 The duet of Macarena Ortuzar and New York based Shahzad Ismaily have played in the USA and Japan since 2000. Shahzad Ismaily (who is signed to the Tzadik label) has collaborated with a variety of artists, including John Zorn, Lou Reed, Laurie Anderson, Tom Waits, Marc Ribot and many more. He is also a member of The Secret Chiefs 3. Of Pakistani origin, he has studied music in Pakistan, India, Turkey, Mexico, Japan, Morocco, Indonesia and Iceland. Macarena Ortuzar is a prominent Butoh dancer based in Oxfordshire, recently back from giving classes in New York, where she used to live and perform. She has collaborated with Butoh dance maker Min Tanaka. Her dance have taken her from America to Japan and Europe. This will be their first European collaboration, an encounter not to be missed !! Opening the event will be Ian Staples and Jon Seagroatt. They are founder members of the pioneering free improvising, avant-rock band RED SQUARE, and have gigged, among others, with Pink Floyd, Mark Bolan, Henry Cow, Lol Coxhill etc. They combine a beautiful visceral playing, compositional flair and subtle electronics. This entry was posted in dance, butoh, movement, diary, events, improvisation, music, pictures and tagged butoh, macarena ortuzar, music. Bookmark the permalink.